Sunkoshi the river of gold is one of the most fascinating and largest river of Nepal. Rewarded as top 10 rivers in the world this fascinating river flows into different region of Nepal. This river offers the longest rafting trip in Nepal a total of 270km and is rated as one of the world’s top ten classic river journeys. Sunkoshi river rafting is the combo rafting package of adventurous fun and scenic beauty. A journey down this large volume river impresses any rafting or kayaking fanatic with soothing canyons, stimulating waterfalls, bat caves, motivating temples, beautiful white sandy beaches for setting up camp and of course a great variety of white water. Sunkoshi River Rafting starts with a scenic drive from Kathmandu to Dolalghat. We then start the rafting tour all the way from the hills of Dolalghat to the plains of terrai. Commencing Sunkoshi river rafting tour let you experience the adventurous and exciting fun of Sunkoshi River and explore the scenic natural beauty along with cultural touch of Nepal. Day 1: Scenic drive from Kathmandu to Dolalghat and start the raft. Today early in the morning after breakfast we driver from Kathmandu to Dolalghat. Enjoy the lunch and then prepare for the rafting fun. We raft for 2-3 hours and then camp by the side. Rest overnight at the camp. Day 2 -7: Rafting Period. 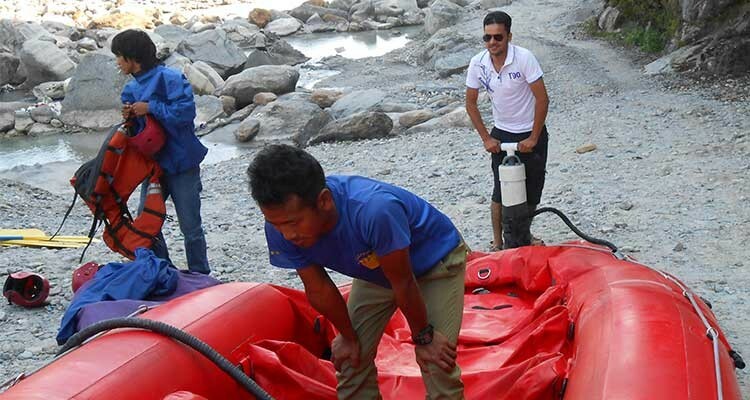 We now start to raft for days camping at the beaches and exploring the unseen region of Sunkoshi River. 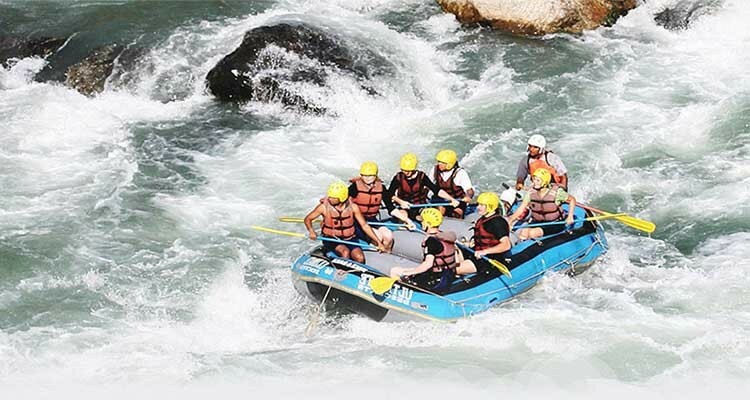 Experience the adventurous and exciting rafting fun into the wide range of difficulties and huge range of rapids. We raft for 5 days flowing in the flow of river some furious and some pleasant. Enjoy the natural scenery and cultural touch by the route. Rest at the camp. Day 8: Paddle till the exit point and then drive back to Kathmandu. Today we paddle awhile till the exit point at Tararha and then drive back to Kathmandu. Hope you enjoy the fascinating rafting ride into furious Sunkoshi River. Health is the most important part of traveling or trekking. One must possess good physical condition before and while commencing Himalaya’s tour. We organize any route of Nepal tour with fix departure basis or private trip, the minimum group size would be two and maximum group size is ten of more on request. We can also organize private trip to solo person with single supplement cost. Else, join our estimated group departure dates available online market or ask us with your personal suitable flexible dates, we will open group date on the same date.